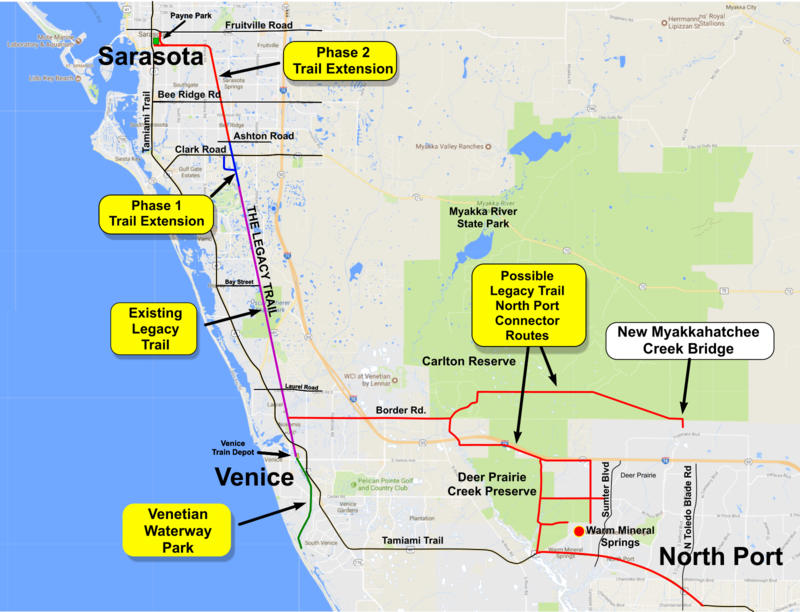 If the November 2018 referendum for funding The Legacy Trail extension passes, money will be available to improve the route connecting North Port to The Legacy Trail. There are on-going discussions between North Port officials, county officials, and members of Friends of The Legacy Trail to determine the best route. The following map shows possible routes that are currently under consideration. At this time the route that is most favored is the southern route that goes along the south side of I-75 and then proceeds straight south to Warm Mineral Springs. The northern route through Carlton Preserve is currently available, however the eastern half of this route consists of a rough dirt service road under a power line. Because the power line land belongs to FPL this route cannot be significantly improved. For this reason there is now a preference for developing the southern route along the north edge of Deer Prairie Creek Preserve. The western section of the route from The Legacy Trail to the Carlton Preserve is on paved roads with a combination of bike lanes, road shoulders, and sidewalks. The eastern section from the Carlton Preserve parking area to the county line is primarily on a gravel power line trail. Access from the trail to North Port is via a new bike/pedestrian bridge near the Myakkahatchee Creek Environmental Park (zoom in to easternmost parking area on map). 0 Park at Nokomis Community Park and take The Legacy Trail a short distance to Colonia Ln E crossing. Go left (east) on Colonia Ln E 0.68 mi to Albee Farm Rd. S. There is a bike lane and sidewalk on both sides of the road. Alternate: Go an additional 0.25 miles north on The Legacy Trail and exit the trail at the wooden bridge on the right. This leads to Florence St, which you can take to Albee Farm Rd and go straight onto Edmonson Road. 0.68 Left on Albee Farm Rd. Bike lane and sidewalk on both sides of road. 0.93 Right on Edmondson Road. 1.90 to 2.94 Pinebrook Rd. Intersection – continue on Edmondson Road. There is now a 10-foot-wide multi-use trail on the south side of the road on this section. 2.94 N. Auburn Rd intersection – continue straight. Road changes name to Border Rd. Sidewalks end. 3.07 Bridge over I-75. Paved shoulders on both sides of road for next 3.44 miles. 6.51 Left on Mabry Carlton Pkwy. Border Rd becomes a gravel road at this intersection. 6.85 Right at Carlton Reserve sign onto gravel road. 16.50 Continue straight to stay on Northport Connector Trail. Trail on right goes to new bridge over R-36 Drainage Canal and leads to Myakkahatchee Creek Environmental Park in North Port. 16.8 At this point the trail takes a 5-mile loop to the north and then returns to the Power Line Trail. The exact route this deviation will take is not well defined at this time and the route shown on the map is approximate.